​Welcome to Transfer Deadline Day LIVE! Join us as we bring you all the latest drama, rumours, collapsed deals and done deals on what is the maddest day in the footballing calendar! I'm Toby Cudworth - ​@themasterplan87 and I'll be here to take you through all the action as it unfolds. 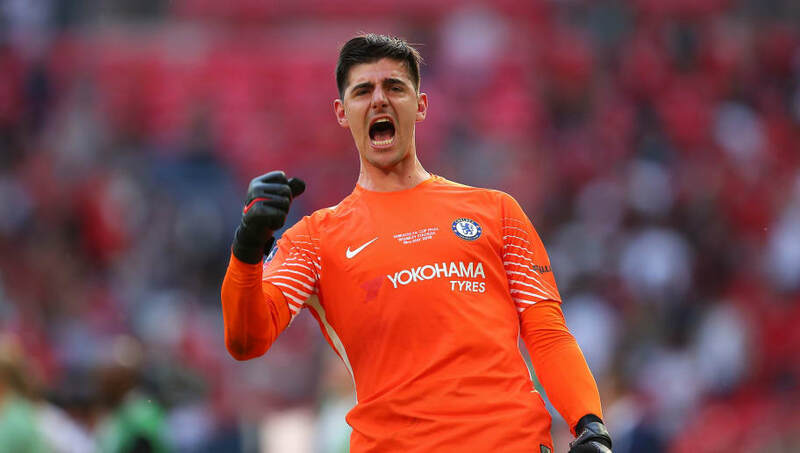 It's been a fun filled morning of action with Thibaut Courtois' move to Real Madrid being finalised, Mateo Kovacic heading the other way and Lucas Perez joining West Ham on a three-year deal. Now time to hand over you to @​Wilfred​Laurence for the rest of the afternoon's festivities. You can catch all of the afternoon action ​HERE! With the Zinchenko deal now seemingly dead in the water, it's time for alternatives at Wolves as they look for additional full-back/wing options. Seems like they may be considering moves for Leicester and Chelsea stars Danny Simpson and Victor Moses. Ambition is there for certain. You little teaser you! Claude Puel addresses his press conference by confirming Harry Maguire will indeed be heading to Manchester..
..but not as you may think! Great bants Claude.  "I can confirm that Harry Maguire is going to Manchester...but only for two hours when we play there on Friday." Another potential outgoing at Everton it would seem, with defender Cuco Martina closing in on a season-long loan switch to Middlesbrough. Potentially decent business from Tony Pulis. Premier League new boys Cardiff City have confirmed the signing of Real Betis midfielder Victor Camarasa on a season-long loan deal. One in, more to come for Neil Warnock and company? It appears that Huddersfield have agreed a deal for Montpellier forward Isaac Mbenza, with RMC (via ​GetFootballFrance) reporting that a €15m deal is done. We await official confirmation from both clubs on this one. 12:50 - JUST OVER FOUR HOURS TO GO..
Well there has been lots of rumours floating around, but actually, it's been a pretty quiet Deadline Day so far. Plenty of transfers still expected to go through, and don't be fooled by the 5pm 'closing' of the window - we'll be hearing about deals long into the evening you would imagine. Could Danny Ings be on his way out of Anfield this afternoon? West Ham are close to completing their tenth deal of the summer, with a swoop for Sanchez - Carlos Sanchez of Fiorentina that season. The Colombian midfielder is expected to move to the London Stadium on loan, bringing Premier League experience with him having previously played for Aston Villa. After Lucas Perez, West Ham will add Carlos Sanchez from Fiorentina. No rush on outgoings from #WHUFC as they will be loans to Championship clubs up until 31 Aug.
Barcelona midfielder Andre Gomes has been an outcast for a number of months, with a move away from the club almost certain. It's come down to Deadline Day, so where is he going? Well, if you believe the latest gossip, he's off to ​Everton - and he could arrive in a double deal involving teammate Yerry Mina. Likely to be loan at this stage though. Confirmation now in that Real Madrid have signed Chelsea goalkeeper Thibaut Courtois on a six-year deal. The Belgian has signed his Los Blancos contract, and will line up in La Liga once more having previously enjoyed a successful spell with neighbourhood rivals Atletico. Wonder what they think about all this? It's looked for the majority of the summer that Ademola Lookman would be heading back to the Bundesliga to join RB Leipzig on a permanent deal. Well that is no longer the case - Lookman seems to be staying, where he will play a prominent role in Marco Silva's side next season. Potentially great news for Toffees fans, and almost like a new signing..
Sky sources: Ademola Lookman is staying at @Everton, ending a summer of interest from German side Red Bull Leipzig. It's been a busy summer at Portman Road for new Ipswich manager Paul Hurst, with eight arrivals following him to the club. Well make that nine, with the arrival of Kayden Jackson on a three-year deal - he'll wear the number nine shirt for the Tractor Boys. ✍️ | We are delighted to announce that @KaydenJackson14 has joined Town, with the striker signing a three-year deal at Portman Road! A new arrival now looking likely down at the AMEX Stadium with Brighton agreeing a £3.5m with Wigan for defender Dan Burn. The 26-year-old is now free to discuss personal terms and undergo a medical with the Seagulls. 11:55 - BOLASIE TO BURNLEY? He seems destined to leave Everton this summer, but where on earth is Yannick Bolasie going exactly? The flamboyant winger has been linked with a return to former club Crystal Palace, as well as a loan move to Championship big dogs Middlesbrough. Now it seems that a third party are interested, with BBC journalist ​Ian Dennis reporting ​Burnley are keen to make a move for the 29-year-old. Could happen..
Well it was probably a bit of a pipe dream wasn't it? Atletico are going places after the summer of recruitment they've had, so it's little surprise to see news that Diego Godin is probably staying put after all. And signing a new deal as it goes! Understand @ManUtd did inquire about Diego Godin earlier this week. Nothing doing. Is set to sign a new contract at Atletico. 11:48 - TWO YEARS AGO TODAY..
And winning ​Premier League trophies - that probably helps as well. John Stones has come a long way since his £50m move to Man City - will he now become the cornerstone of their Premier League title defence? 11:45 - TOBY.....OR NOT TOBY? All quiet on the Toby Alderweireld front so far - will the Tottenham defender get his long awaited move to Man Utd over the line? It seems unlikely - but you never know what could happen. It is Daniel Levy involved after all! Yerry Mina reportedly set to undergo a medical with Everton ahead of a move from La Liga giants Barcelona. The source? None other than Deadline Day legend Jim White! A medical being lined up by @Everton in Barcelona for Colombian defender Yerry Mina. Watford are on the hunt for midfield additions, and a move for West Brom midfielder Jake Livermore looks like it's edging closer. A loan deal with option to buy is the latest line from Sky Sports News journalist Adam Leventhal. Understand deal to bring @WBA’s Jake Livermore to club is being worked on. Loan with option to buy. Napoli are in the market for a new goalkeeper are the summer departure of Pepe Reina to Milan, with Arsenal goalkeeper David Ospina rumoured to be a potential target. However, it appears he may not be the only goalkeeper in their crosshairs, with Italian news outlet ​GianlucaDiMarzio suggesting that Liverpool outcast Simon Mignolet is being considered. With Mateo Kovacic's arrival at Stamford Bridge, you'd imagine that Danny Drinkwater's game time at Stamford Bridge could be somewhat marginalised. He has been linked with a loan move to London rivals West Ham, but it seems a move further afield could be in the offing. The big story of the past 24 hours remains Chelsea's sensational capture of Athletic goalkeeper Kepa Arrizabalaga for a world record goalkeeping fee of £72m. He looks pretty chuffed to have arrived it must be said. 11:14 - ARTER NO GO? We brought you earlier news that Cardiff were chasing a loan deal for ​Bournemouth midfielder Harry Arter. Well, it seems he may not be going to the ​Cardiff City Stadium after all! 11:10 - DIEGO GODIN......TO MAN UTD? Wow, this one has come out of the blue. We know that United are desperate for defensive reinforcements, having spent all summer reportedly tracking Toby Alderweireld and Harry Maguire among others. Could Diego Godin be a late contender for shock move of the transfer window? We'll see..
10:58 - HUDDERSFIELD KEEN ON MAN CITY YOUNGSTER? Many people would consider Huddersfield among the favourites for relegation this season, so investment is likely paramount to give them a hope of second season survival. Local source ​The Huddersfield Examiner claim that manager David Wagner is lining up a loan deal for Man City youngster Patrick Roberts. The winger has previously been on loan at Celtic, but is ready to step up in class and prove himself in the Premier League - perhaps the John Smith's Stadium will become his platform. I do apologise for that Love Island reference, I promise it's the only one for the day. Seems like business will be concluded at Goodison Park this afternoon, with a number of deals on the horizon. Yerry Mina and Bernard potentially on the way in, with Yannick Bolasie and Mo Besic leaving? Quite likely it seems..
Everton increasingly confident of signing Yerry Mina today, with Bernard due to be confirmed this afternoon. Besic to Boro for £4m. Offered Andre Gomes during talks with Barca - loan not ruled out but getting Mina done is the priority. The first incoming of the day is complete at ​Leicester, with the club confirming the signing of defender Filip Benkovic. First of two possible centre-back recruits is secured for Claude Puel's side. 10:45 - DID I SAY TWO? I MEANT TWENTY TWO..
Well you get the feeling it could become that way anyway. Just as I finish typing, another link emerges for Fulham - this time regarding right-back Martin Montoya. The Cottagers reportedly in talks with Inter over a possible deal..
A return to the Premier League seems to have gone to ​Fulham's head, with signings pouring in from all angles. It seems at least two more signings are on the way, with ​MailOnline Sport reporting that a loan move for Sevilla goalkeeper Sergio Rico is nearing completion. The fun does not stop there though, with French news outlet ​RMC claiming that the Cottagers are eyeing a €30m move for Marseille midfielder Andre-Frank Zambo Anguissa.. It's signing number nine for West Ham this summer, with confirmation of Lucas Perez's move for Arsenal now received. The 29-year-old joins on a reported three-year deal - and takes the Hammers spending over £100m in the process! ​Tottenham are refusing to give up their interest in Aston Villa midfielder Jack Grealish, with ​ESPN claiming that Daniel Levy is readying a £30m bid. Villa are adamant they don't want to sell, but Grealish is reportedly very unhappy with the club's stance - could a deal still be done? 10:17 - ZINCHENKO SAYS NO? Manchester City's young versatile midfielder looked to be on the verge of a £16m move to Molineux, but it seems Zinchenko doesn't fancy the move after all - despite an agreement being in place between the teams for several weeks. Hearing the Zinchenko deal is OFF as the player has turned down the chance to join @Wolves, according to sources in Manchester. A £16m fee had been agreed several weeks ago and a medical had been arranged at Compton this morning. I do love a good Jose Mourinho press conference. The Portuguese boss is clearly in no mood for playing around, and doesn't 'expect' any new signings to come in today. He's also slipped in a cheeky little dig this morning..
Mourinho ahead of #MUFC's Premier League opener: "It is difficult to believe that we finished second because you are capable of making people that finish second look like they were relegated, and people who win nothing, finish below us, and you make them look like serial winners"
We knew it was coming after last night's Thibaut Courtois announcement, but now we have official confirmation from Chelsea. Real Madrid midfielder Mateo Kovacic joins the Blues on a season-long loan deal, providing Maurizio Sarri with yet another quality midfield option. He then got wind of Fulham's interest, and jumped in the car bound for west London. Naughty stuff. Another huge signing in the pipeline for ​Wolves with Belgian midfielder Leander Dendoncker, with a £12m deal close to being done. Medical passed, so now we just await confirmation..
09:44 - ROSE SET FOR TOTTENHAM EXIT? It's a curious story, with Danny Rose long linked with a move to ​Manchester United. Now, after a glut of injuries and the form of Ben Davies, Rose could be on the way out. If ever you needed reminding of just how big Chelsea's pool of players, let this tweet from the Telegraph's Matt Law remind you of the resources at their disposal. Chelsea expect to sell or loan out up to 15 players by the end of August. A few should go today. ​Southampton are not prepared to let full-back Matt Targett on the cheap - Fulham are desperate to bring him back to Craven Cottage after a successful loan spell last season. Bids of £14m and £16m have been rejected so far, with the Saints reportedly demanding £20m. Wow, what are prices these days? 09:25 - WAY OUT FOR BESIC? ​Leeds manager Marcelo Bielsa is preparing a bid for Everton midfielder Mo Besic - with the Bosnian midfielder desperate to find a way out of Goodison Park. The ​Mirror report that Bielsa is prepared to pay £4.5m to bring him to Elland Road, although a loan deal could happen if the teams fail to agree terms before the 5pm deadline. Besic proved his worth in the ​Championship last season, enjoying a productive spell on loan at ​Middlesbrough. After seeing a proposed £8m move to Burnley fall through, it would seem that Swansea midfielder Sam Clucas will be heading to ​Stoke. How do I know this? Well he's there......right now. Look! Well it wouldn't be Deadline Day without the musings of the ever insightful Richard Keys, so here is a reminder of his journalistic brilliance from last year. All we need now is the Mark Lawrenson Twitter account to spring into life and all will be right with the world! So the window 'slams shut' today. Count how many times you hear that said. Truth is it simply 'closes'. First bit of transfer activity up at St James' Park, and it's a big one. Well, if you're a Peterborough fan it is anyway..
Ivan Toney has completed a permanent move to join Posh from ​Newcastle, having been out on loan more times than I can possibly count. Good luck to @ivantoney24, who has completed a permanent move to @theposhofficial. ​Crystal Palace look set to complete the signing of Jordan Ayew on a season-long loan from ​Swansea. A bit of support for Wilfried Zaha, and dare I say Christian Benteke..? 09:01 - SLIMANI OFF TO TURKEY? It seems that Islam Slimani's time with Leicester is most definitely up, with the £29m signing looking like he's on the way out. ​Sky Sports reporting that Fenerbahce, Besiktas and Sporting CP are chasing the Algerian's signature - could be a big money day down at the King Power Stadium..
Could be a busy day in the Welsh capital with Cardiff reportedly working on a loan deal for Real Betis midfielder Victor Camarasa. Well if you weren't convinced that Warnock wants midfielders before, you probably are now..
Much like they will probably do in the majority of their Premier League games this season, Man City have struck first - they have confirmed the signing of Daniel Arzani from Melbourne City. One man on the move is former Premier League winner with ​Manchester City, defender Bacary Sagna. He has signed for Canadian side Montreal Impact as he enters the latter stages of his highly successful career. LIRE | @AJA. @Arsenal. @ManCity. @bncalcio. Et maintenant @impactmontreal. 08:42 - ARTER ON THE MOVE? Speculation this morning that Cardiff are in talks with Bournemouth over a loan deal for midfielder Harry Arter - manager Neil Warnock clearly looking for Premier League experience ahead of the Bluebirds return to the top flight.
.@CardiffCityFC in for Bournemouth midfielder Harry Arter. Would be a loan deal if it goes through. Popular consensus would have probably considered Tammy Abraham as a prime candidate for another loan spell away from Chelsea this season. Well, according to the ​Mirror, Abraham is set to stay at Stamford Bridge, where he will feature more prominently under Maurizio Sarri. Who says ​Chelsea don't give their academy graduates a chance eh?